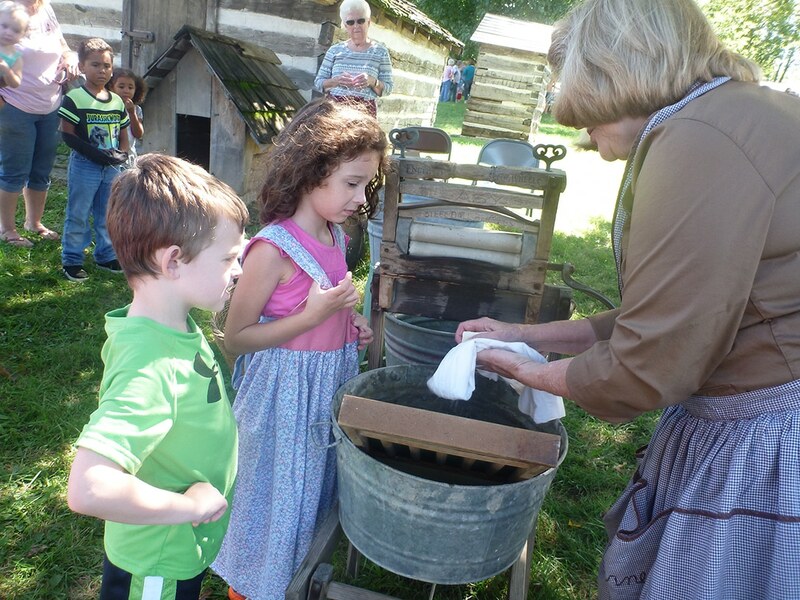 Located across the street from the Henry County Museum, the Homestead gives people the opportunity to see what it was like to grow up in rural Missouri in the mid-19th century. The Homestead consists of five historic structures which have been moved to the site. The one-room schoolhouse is furnished as it would have been when in use in rural Henry County, with wood desks, a wood stove, raised dais with teacher’s desk, chalk boards and pull-down maps. For class field trips, a docent in costume plays the teacher, showing students what it was like to attend a one-room schoolhouse and do lessons on a slate. Also on the Homestead is an authentic dog-trot log house, built near Montrose in the mid-1850s. On one side is the kitchen with fireplace, on the other a bedroom. Also on the Homestead grounds are a mule barn with wagons and farm tools, a corn crib and a smokehouse. Candle-dipping, crafts, games and stories are some of the “fun, free activities with a hint of history” that the museum Children’s Corner program offer. For more details about farm life in the 19th century, go to the third room of the main museum, formerly the loading bay of the Anheuser-Busch Building. There you will find a blacksmith’s forge and anvil, ice saws and tools used in broom-making, flour milling and farming.